Martin Luther King Jr. Photo from Getty Images. 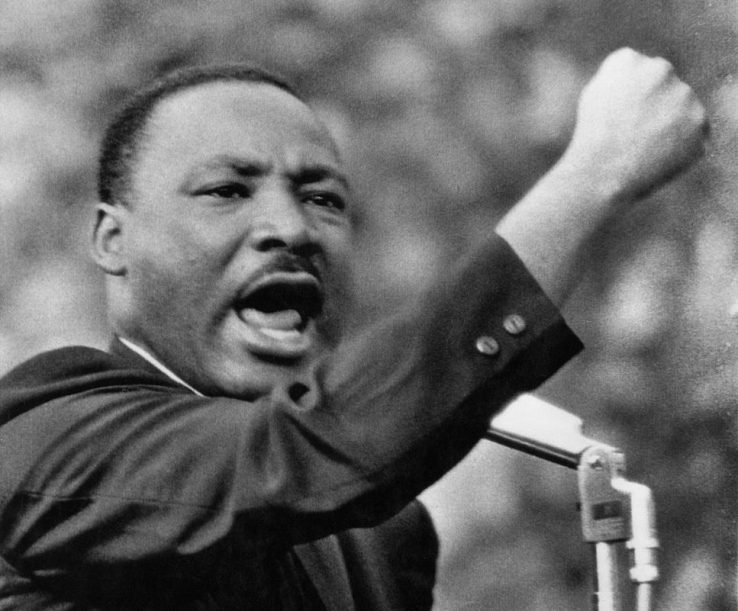 If one had to define who Martin Luther King Jr. was, how would he be defined? He was a Civil Rights activist— one might say. He had a vision that everyone would unite one day— another might say. He delivered the “I Have a Dream” speech— yet another might say. But these descriptions merely scratch the surface of what Martin Luther King Jr. did in history. As an activist, King had a vision for blacks to join whites one day, while not resorting to violence to reform society. More than that, King helped heal America through one of the toughest times in American history. Dr. King raised questions regarding the values society stood for. He raised the questions of justice, dignity, and truth for those who were leading the country. He was a man of action and spoke with courage and humility, empowering the weak to stand together. The campaign for a federal holiday in King’s honor began soon after his assassination in 1968, legislated by President Ronald Reagan in 1983. it would first then be celebrated in 1986 as a federal holiday affecting the closings of schools, businesses, banks, and other public and private institutions to honor King’s legacy. Schools in the Milwaukee Area District honor Dr. King by closing down as do multiple districts around in the South. In the past, although D.C. Everest Senior High School leaders mention short snippets regarding MLK day, staff members have rarely discussed him or his message to students. We asked 107 students how many teachers mentioned or acknowledged Dr. King on Jan. 15 throughout the day. It is understandable that this survey makes up only 6% of the student body, but this shows how little importance this had on staffs and students. Seventy-two students said none of their teachers mentioned King. Twenty-five students said one teacher mentioned him, while seven said two teachers did, and two said only three acknowledge him. The essential question is whether or not the D.C. Everest Senior High District should have off on that day or not. The question is, what can the schools and faculty members do to acknowledge Martin Luther King Day. The D.C. Everest School District should have school that day, but staff members should take the initiative to talk about the importance of Dr. King and his message of tolerance and unity. “Martin Luther King Day is a day of reflection. It is a day of looking at society and asking, ‘are we or have we improved our society for equity,’” said Mr. Matthew Kleinschmidt, social studies teacher. On Jan. 15, which was MLK Day, Mr. Kleinschmidt talked about equity versus equality, reflecting on the goals of the day with his classes. We believe that if MLK Day fits into a course or curriculum, teachers should recognize the impact he had furthering America into a just society. Even a ten minute talk or discussion with the class about Martin Luther King Day will make a difference. If MLK Jr. does not fit into a course such as woods class, teachers should still acknowledge him somehow. A simple, ‘Happy MLK Jr. Day,” will make an impact to some students. Teachers should include rich discussions that allow for students to open up about their backgrounds and problems they face on a daily basis. There is a reason we have these days and why they are Federal Holidays such as Martin Luther King Jr. Day, Susan B. Anthony Day, Labor Day, and Veterans Day. These days had made a significance in the United States of America, helping everyone to live in a more fair community. Martin Luther King Jr. Day should not be looked over. Next, the school can begin to prioritize Martin Luther King Jr. Day by celebrating or having events to do with ethnicity and different cultures that are in this school. MLK Jr. is not a symbol for the minorities in just D.C. Everest Senior High, but for society as a whole. Are staff members helping others reflect as a society, to acknowledge people of their conditions, situations, and know what the community is lacking in the division of a just society? The school is learning about diversity and going to conferences, but should more be done on MLK Day, a day where we celebrate all kinds of diversity? The last time some students were taught about Martin Luther King Jr. was in elementary school or middle school. As we grow up, our perceptions of society change, exposing us to more aspects of the ‘real world.’ If the high school acknowledges Dr. King and the violence, the struggle, the time, and the pain Civil Rights activists had to go through (in elementary school, teachers did not bring up violence but just the impact of Dr. King), then that can already have an impact in society today, where violence is everywhere in the media. Not all teachers have to talk about MLK Day, as it might drain the students out from hearing it repeatedly. In that case, there should be a mini event or assembly with a speaker who speaks about diversity during the beginning of school or during Extended Learning Time. Martin Luther King Jr. Day is not just about recognizing what he did in the past, it is about what we are doing in the present time as well. It is the call to action on what we can do, even if it is just for a day. Jan. 15 is about not recognizing our differences, but rather embracing them. On MLK Day, Mrs. Dickerson talked to her students about who Dr. King was, what he stood for, his message, and equality in today’s society. A school’s job is to help students see at the same level [regardless of race, gender or religion] of other people’s background, as well as where they come from and to embrace it. In school, there is a diversion in school with labels, cliques, and prejudice. There will always be prejudice outside and some will always take it to the school. However, just because there will always be prejudice does not mean schools should not put any effort into uniting— which is what King also stands. Observance days give certain individuals and events a proper emphasis on what they did, not only in Wisconsin history but U.S. history. It can be a rich curriculum for students to know and to understand. Maybe the fact that a teacher acknowledged Martin Luther King Jr. Day or the school celebrating the day by informing students can be enough. Or maybe, if one person is positively affected and inspired by the recognition, that should be enough. And like a domino effect, maybe that positivity can spread to others as well— even if it’s just for a day.